Of course, we don’t deny that the wonderful design, building and engineering work done by the pros is a bit beyond most of us. But by learning some simple principles of design, construction and calibration, you can achieve marvellous results yourself. All it needs is a room, a budget, plenty of time and some elbow grease. Our example project is a living room in a typical Thirties semi, but your space may be a garage, basement, loft or even an outbuilding. The principles are the same and the results can be just as stunning. 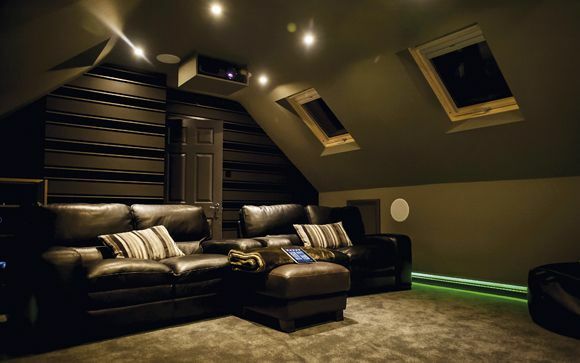 Most of the skills you need to build your own home cinema room are no more demanding that those of putting up shelves, hanging a door or boarding out a loft. But needless to say, you will need basic DIY knowledge and tool-handling skills. If you can’t face the prospect of drilling walls, sawing timber, lifting floor-boards or soldering connections, you won’t be able to do the work alone. The trick is to know your own limitations and call in the professionals when needed; that way, you’ll keep the budget down and keep control of your own project. Stealth: Apart from the display, most of the system elements are hidden. The display is typically wall-mounted rather than stand-mounted, the speakers may be hidden behind the screen or in-wall, and the source devices are hidden in cabinets (or even outside the room). Cabling is, of course, invisible. Scale: The screen is larger than you would expect in a standard living room: either a large widescreen TV, or a front-projection system, possibly both if the projection screen is a roll-up type. Lighting: Lighting is controllable so the room can be darkened for viewing. Seating: Seating is arranged so viewers are at the ‘sweet spot’ of the surround-sound system. Control: System control is simplified by incorporating the plethora of remote controls into one handset. Lighting and other systems may also be incorporated into the control system. Acoustics: The room is acoustically treated to reduce sound interference from outside, limit leakage from the room, and eliminate phenomena such as ‘standing waves’, which might reduce sound performance. Calibration: The system is calibrated so it reaches the optimum levels for picture and sound performance, in line with industry standards. Our room is pretty close to the average UK living room size of 16x16 feet. It features a large fireplace and bay windows, both of which were destined to cause trouble! Our first task was to determine the position for the equipment. There wasn’t much choice in the matter; the wall facing the window was the most suitable space for the screen, so the seating would have to be in the window bay. Having decided on concealed in-wall and in-ceiling speakers, the alcoves either side of the fireplace would have to be pressed into service to conceal the dual subwoofers. The fireplace itself would have to come out, and the space be bricked up, then the alcoves battened out to provide a flush wall. At an early stage of your project, you will have to make some decisions about where to lay your cabling. It doesn’t much matter what route your cables take from source to display or speakers, so long as you don’t damage them by pulling them through walls or conduits, stapling them to battens, bending them around corners or resting them on abrasive edges. In this case, we opted to run the AV and speaker cables through a false ceiling, rather than take the alternative route of lifting floorboards. The other argument for a false ceiling was that it gave us somewhere to install recessed lighting and a trapdoor projection screen, along with four surround speakers. The relatively small size of the room dictated that the speakers should be boxed into the walls, and Velodyne’s SC-IW is ideal for this purpose. A slim-line, two-box solution, which fires vertically courtesy of a T-shaped driver design, the sub ports out into the room, via either a 14in grille or much smaller 5in letterbox. We added the SC-BB backbox from Velodyne’s SubContractor series, designed to minimise vibration, essential with such powerful subs. As they are passive designs, both Velodyne subwoofers would run from a single outboard amplifier, the Velodyne SC-1250, which has 1250W of output. The wooden battens we had fitted formed a frame for the two enclosures; the top enclosure back-box sits flush with the wood-work, while the lower driver module sits proud, so the plasterboard has to be cut around it before the grille is attached. Having opted for in-wall Left-Centre-Right speakers, we had to build a false wall to accommodate these and the screen. Definitive Technology’s Reference UIW RLS 11 in-walls offered the rich, articulate audio we wanted. With their aluminium dome tweeters and high-performance drivers, they are ideal for both music and movie applications. Of course, any modern home cinema installation has to be networkable. Whether immediately or in the future, it has to be possible to connect media players, NAS drives, PCs and other DLNA-compatible devices to the entertainment system. Our plan was to create a server rig in a boot room. This was connected by CAT5 cable into the home cinema. We figured out that this network could also be used for lighting control. The lighting system we chose, from Niko, has some marvellous options including invisible light switches, which are activated by proximity and Ethernet ports that can be matched to your wall colour. We settled on IXOS cabling for the majority of our installation, as it offers a good balance between cost and performance.For speaker cabling, we went with IXOS’ XHS523 Parallel Geometry low-resistance silver speaker cable. A 100m drum proved plenty for the job, with some left over for emergencies. The IXOS interconnects including a pair of 15m HDMI leads, VGA, S-video, component, composite and a 3.5mm lead to provide a 12V trigger were laid across the ceiling beams, linking the position of the ceiling-mounted projector to the electronics positioned under the screen. The ceiling cabling was all checked for signal integrity before going ahead. The last thing you want to have to do is to tear down a ceiling after it’s been plastered. Next time: Why you should measure the height of your ceiling before trying to install your projector screen, how plasterboard can save you the expense of soundproofing, and much more!